This exceptional antique English sterling silver tea and coffee service consists of a coffee pot, a teapot, a cream jug and a sugar bowl. Each of this four piece silver tea and coffee service has a melon shaped form onto four impressive bracket feet. The rounded, incurved panelled body of each piece is plain and unembellished; the teapot, coffee pot and sugar bowl have flared upper rims. The antique teapot and coffee pot are fitted with domed hinged hallmarked sterling silver covers, reflecting the formation of the body. The covers retain the original hallmarked sterling silver finials realistically modelled in the form of a stemmed flower accented with foliate decoration. Each piece is fitted with shaped sterling silver handles, ornamented with large scrolling leaf decoration incorporated into the thumbpieces. 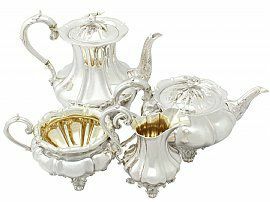 The teapot and coffee pot have swan necked spouts embellished with floral and leaf chased decoration to the underside. The interior of the cream jug and sugar bowl retain the original gilding. This fine silver teapot, cream jug and sugar bowl were made by William Theobalds and Lockington Bunn in 1835 and the coffee pot was crafted by Richard William Aitkens and William Nathan Somersall in 1837; this service would have been sold by one retailer as a complete set. This antique tea and coffee service is an exceptional gauge of silver, exceptional quality and in exceptional presentation condition. Full hallmarks struck to the underside of each piece and part hallmarks struck to the cover, handle and finial of the teapot and coffee pot are all very clear. Reflections in photographs may detract from the true representation of these examples of 19th century silverware. Length from back of handle to tip of spout 24.5cm/9.6"
Height to top of handle 23.5cm/9.35"
Length from back of handle to tip of spout 26.6cm/10.4"
Height to top of handle 14.8cm/5.8"
Length from back of handle to lip 13.2cm/5.5"
Height to top of handle 12cm/4.7"